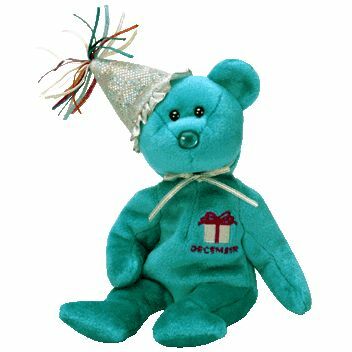 December 2 is made from a turquoise material with black button eyes and a turquoise button nose. He wears a silver party hat with multicoloured strips attached to the the top of it. He also wears a silver ribbon tied around his neck. Embroidered on his chest is a birthday present with the word “December” underneath it in red thread. December 2 was released on 27th March 2003. He is part of the second range of Birthday Bears. The colour of his nose is supposed to represent Turquoise, which is the birthstone for December. He retired on 27th March 2003.